Ross golf course is situated within walking distance of Killarney town centre. It prides itself as being one of the best 9 hole golf courses in Ireland. With its magnificent backdrop of the McGillycuddy Reeks mountain range, this parkland course has become a firm favourite on the golfing circuit. Killarney Racecourse is a hive of activity during the many racing festivals that take place every year. Prior to the establishment of Ross golf course, the racecourse lay dormant for 48 weeks of the year. The opening of Ross golf course breathed new life into a spectacular part of the town. The course was opened in 1995 and has continues to grow from strength to strength. 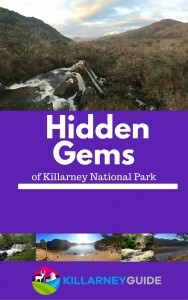 This convenient, compact and charming course is also very appealing to those that visit the Killarney area every year. Ross golf course is located in the Killarney Racecourse on Ross Road, Killarney on the verge of Killarney National Park. The Racecourse is home to Killarney’s horse racing festivals and also hosts The Celtic Steps show. It is less than 1 km from Killarney town and Ross Castle and the wonderful trails of Ross Island are a further 1km along Ross Road. There is a full set of directions available on the Killarney Racecouse website here. In addition to its magnificent setting, Ross is a great course in its own right, offering a good mix of pars and variety through the course. With the option of doing a 9 or full 18 hole round, the course suits all types of golfers from beginners to battle hardened veterans. Naturally, the course is influenced by the racetrack but it is not defined by it. The holes are situated both inside and outside the track rails and this variety adds a nice balance as you complete your round. You can find full details about the course, green fees, membership and other information on the Ross golf course website. The course is all year round with the exception of race days at the Killarney Racecourse. If you are planning to visit, be sure to check the Killarney Races website in advance. There is ample parking available and it is less than a 15 minute stroll to Killarney town centre. An early morning round of golf at Ross is a great way to start the day. On a summer’s day, the sight of the mist burning off the McGillycuddy Reeks will inspire you to greatness on the course. That’s the theory anyway! After your round, you can enjoy refreshments in the clubhouse before exploring some more of the sights around the nearby Ross Castle. For those that have only visited Killarney Racecourse during racing festivals, a whole new experience awaits you at Ross golf course. In contrast to the pounding of the hooves and the packed grandstands, peace and solitude reign at Ross for most of the year. For more information, visit www.rossgolfcourse.com.